Recently I gave a talk at Data & Society, a think tank in NYC that focuses on issues of social justice and technology. 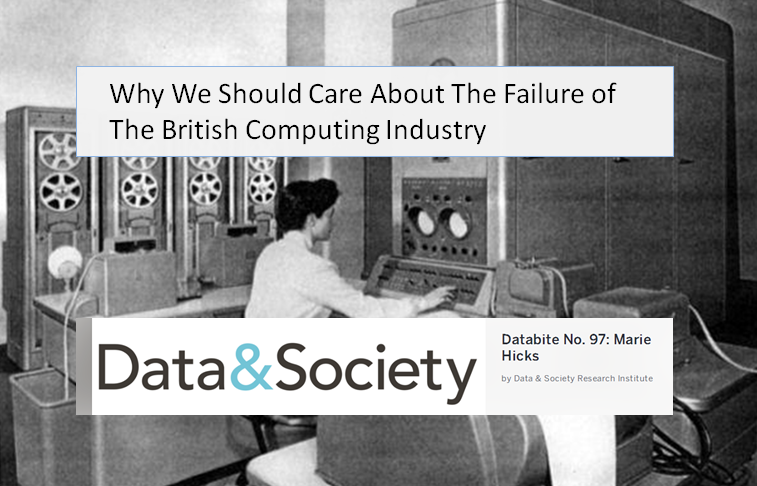 The talk was about how the history of computing of our closest historical cousin, the UK, can help us learn things about the past and present of the US–things that we may be blind to, or perhaps just resistant to seeing. The half-hour talk is an overview of what happens when countries build discrimination into technological order, rather than seeking to make equality a core goal of technological progress. In it, I address how the current state of affairs in the US relates to this, and I offer some advice on solving the problems of underrepresentation in STEM fields today. Watch the talk here.